Two hook rigs are very popular in Canterbury for sea-run trout fishing. The bottom rig in the picture below could be described as the standard sea-run trout, kahawai and salmon fishing rig for the Waimakariri, Rakaia, Rangitata and Waitaki Rivers. It is the best of the two hook rigs and is usually tied with 20 lb monofilament line. You might try lighter line in very clear low water. The longer trace would be about 120cm and the shorter one 80cm. You can shorten or lengthen each trace depending on rod length and personal preference. Many successful anglers will tell you that longer traces are better fish catchers. 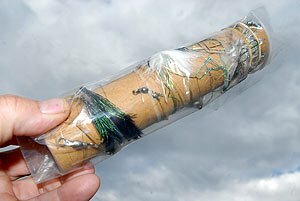 The second lure, or streamer fly, swims about 30cm behind the first with each trace being tied to a size 8 black barrel swivel with a uni knot. I often tie a lure at each end of a 2m length of monofilament then double the line over at about 80cm from one end to form a double with the longer end 120cm long. Then tie this to a swivel with an end loop knot leaving perhaps 3mm of the loop showing at the knot. This method is quicker and simpler than cutting the line and tying two separate uni knots. 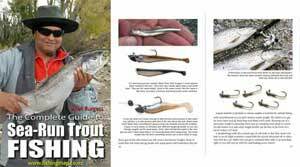 Also, take a look at Feathered Lures for Salmon. This double rig isn’t without problems. Even the very best anglers get knots and tangles casting this double rig. Sometimes you can make 20 casts with no trouble at all then on subsequent casts the rig keeps tangling. Using the “right” monofilament lessens the number of tangles. Unfortunately, there are many different opinions as to which are the best monofilament lines to use. Stiffer mono doesn’t tangle and form wind knots as readily, but when knots do form in stiff mono it is much harder to unpick them. I have used this two hook rig for almost 30 years. About ten years ago a good mate of mine showed me the top rig in the picture which he fishes to good effect in the Waimakariri River. This uses a second swivel closer to the lures. It doesn’t tangle anywhere near as much as the traditional rig. This short “two swivel” rig works at least as well as the first rig for fishing the slower water of the Waimakariri River but when fishing the faster flowing lower Rakaia River, and gut, it appears to cause more foul hooking of fish. Just before Christmas I foul hooked and released five large sea-run browns from the lower Rakaia, and the surf, on this two swivel rig in just two days. However, it has to be said that I, and many other anglers present, also accidentally foul hooked plenty of fish on the traditional two hook rig. There were so many silveries in the river and surf that most lures were probably ignored by the trout anyway. I almost never foul hook a sea-run in the Waimakariri River fishing the same gear. There are other methods of tying two hook rigs for sea-run brown trout but the bottom one shown in the picture is the one that almost everyone uses. The best idea is to tie several dozen rigs at home and wrap them around cardboard tubes. Carry these in your pockets when fishing. Then when you do get a hopeless tangle quickly tie on a fresh rig. Please note that the picture isn’t quite to scale. Please rely on the measurements given in the text instead. The overall length of the two different rigs shown are the same. Note that some expert and highly successful Canterbury Lure Rod anglers use the bottom rig of the two shown with much longer traces. I have seen these used with trace lengths of 1.5m and even 2m. The lures look more natural on longer traces; however such long traces can lead to problems with frequent tangles.